The original Dark Souls is a masterpiece of game design. A punishing action-adventure hack and slash game, it’s a title that stands in a worthy spot on many “greatest games of all time” lists. Though the story and lore of the game’s world is opaque, players are given glimpses of it in item descriptions and conversations with other characters. Over eighty hours, my initial frustration with the game gave way to adoration and excitement. 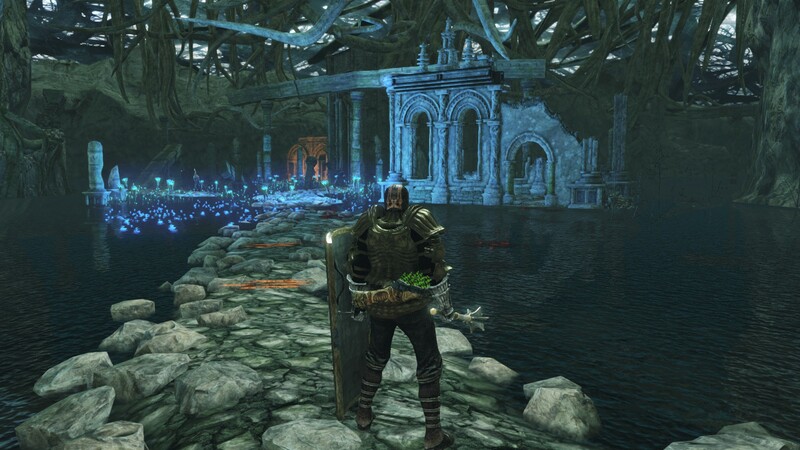 Though frequently frustrating, the world of Dark Souls had a balance of trials and reward. When you spend hours fighting for every inch of new territory, the game rewards you for it accordingly. By the time I’d made it through the Abyss and on to the Kiln of the First Flame, I felt like I’d accomplished something. 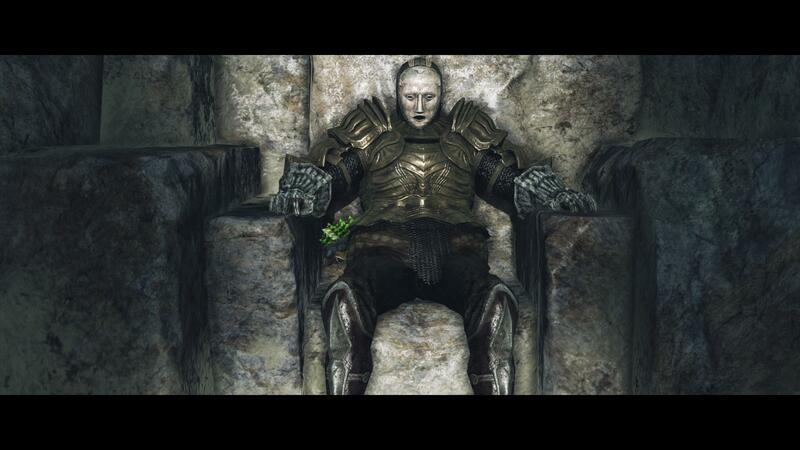 Victory over Gwyn, Lord of Cinder is a fist-pumping achievement and worthy of bragging about. The game’s design clearly led to this moment, building the world in such a way that you can recount nearly every step you took from start to finish. 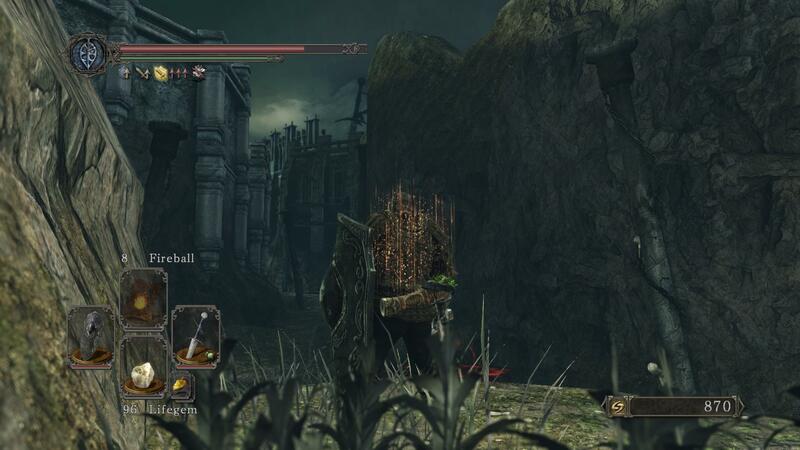 Dark Souls II lacks a sense of continuity and purpose. That’s notable, because Dark Souls games are not known for having a clearly communicated story. Hints of lore and world building are hidden in item descriptions, loading screens, and in conversations with other characters. If you’re really interested in the story, you can go online and read detailed history lessons contained on the Dark Souls II wiki. I’ve not spent any time going through the lore. Personally, I figure that if the game doesn’t try very hard to make sure I know what the story is, it can’t be that important. Why should I care about something if the game itself obviously doesn’t? 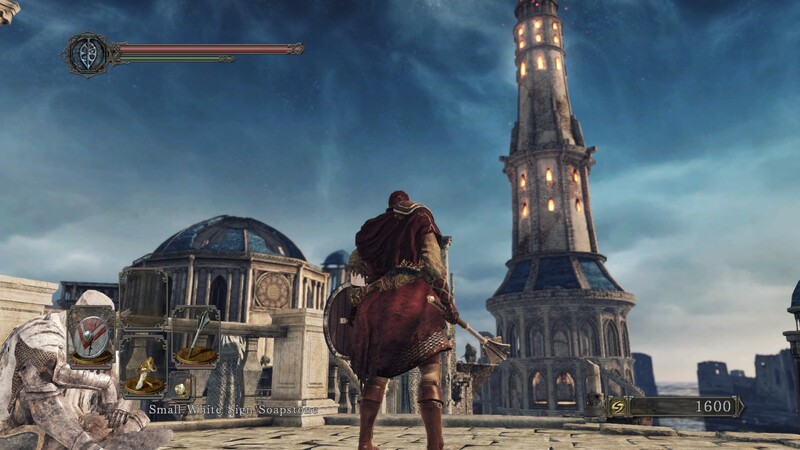 The original Dark Souls had a similarly hidden story, though the game’s world made up for it. By means of visual signposting and excellent level design, the player always knew where they were supposed to go next. Discovery of the world was motivation enough for me to want to keep playing. Dark Souls II lacks that key ingredient. Since the story might as well not exist, the world design alone carries the weight of motivating the player to keep moving forward. Though the game contains some compelling locations, the whole of the game’s world, Drangelic, lacks a sense of cohesion. See the ruins, bridge, and tower in the distance? You don’t get to explore any of that in DSII. Take Huntsman’s Copse, for example. Emerging from a cave, the player sees a large tower sitting atop a cliff. To get there, you must battle your way through a misty forest filled with bandits and poison moths. Eventually you arrive at an ominous passage. Dark walls tower over a narrow walkway lined with irregularly placed stone pedestals. Each pedestal serve as perch for a Purgatory Guardian. These are the toughest enemies I’d yet faced in the game. Armed with whips and giant staffs imbued with the power of dark magic, they are a challenge when fought singly. Advance down the corridor and they’ll drop down to engage you. Advance too much at one time and multiple guardians will engage you. Each fight was tense and stressful, followed by the release of defeat or elation of victory. This sequence is classic Dark Souls; challenge, risk, and reward. It’s a satisfying gameplay sequence. Eventually you’re allowed to walk through the passage and across a rope bridge to the ominous tower. A fog gate awaits you. There’s a boss inside. The Executioner’s Chariot is a two-stage boss fight that’s pretty standard for Dark Souls games. The fight itself is merely the logical progression of your battle with the guardians outside. Dying here means you must face the entire gauntlet again. Victory means satisfaction, reward, and the incentive to keep progressing forward. Except not in the way I’d hoped. It took me at least ten attempts to figure out how to get through the passage with the guardians, and I died at the hands of the boss at least six times. After so much pain and time and effort to take out a boss, I expected to be rewarded. My hope was that I’d keep fighting up through the tower, discovering some cool new location above the misty woods I’d been trapped in for so long. But, no, that was not to be the case. On the fateful attempt when I did achieve victory over the Executioner’s Chariot, I was sorely disappointed. There’s nothing new to discover. The room that contained the boss was just a hallway; a circular hallway! One alcove contains a bonfire, but that’s it. The payoff for all my hard work is that I get to warp out of a dead end and start another journey somewhere else. This is the Shrine of Amana. Everybody on the internet hated it (do a search, but beware salty language), but I loved it. This scene repeats itself more times than I can count in Dark Souls II. The game introduces a new locale, only to cast it aside and shift someplace else after a scant hour or two of gameplay. There is quite a diverse range of locations to explore. 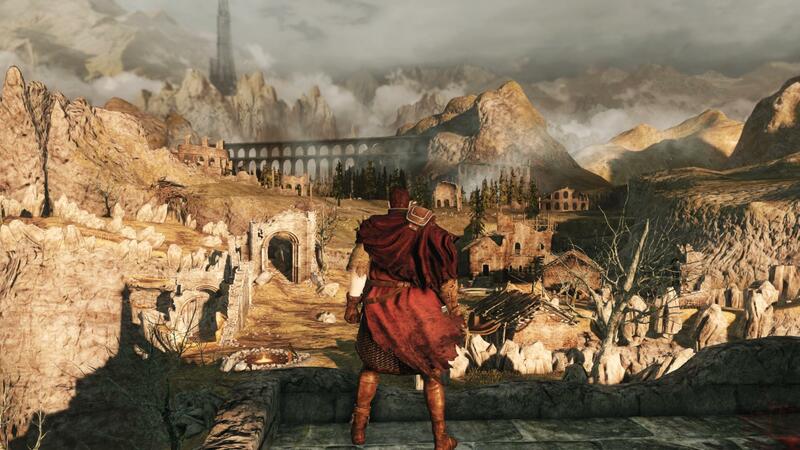 Seaside towers, a haunted ship berthed in a cave, misty and foggy woods, stone caverns lit by poisonous green pools, an iron castle sinking into a pit of lava, another castle that seems to float above the world, frozen castles; Dark Souls II has it all! And that’s part of the problem. Instead of each area contributing to the feel of the world, it feels like someone made a list locations that sounded cool and tossed them in without any justification. While most of these places are beautiful, the game clearly values quantity over quality. There are thirty-four different locations, and almost all of them have their own boss. Thirteen of those locations have a single resting point. You’ll be in those locations only long enough to fight some enemies, beat the boss, and move on. This section of Undead Crypt made me want to quit the game. For the most part, that’s not a problem because Dark Souls II is still fun to play – to a point. 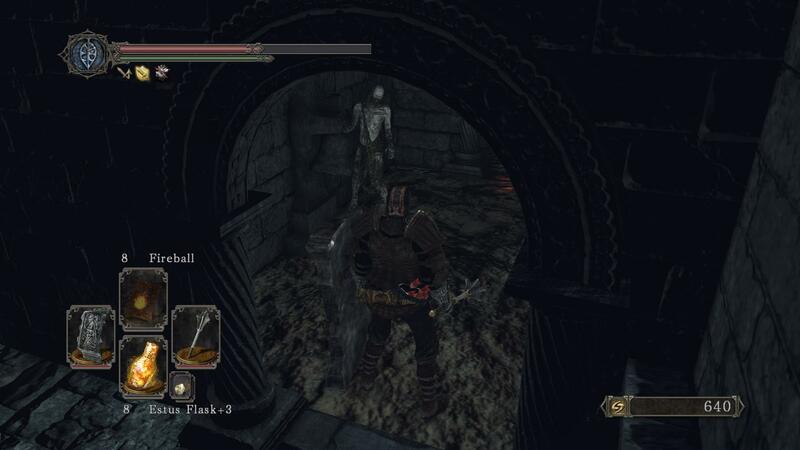 The combat system imported all of the good things from the original Dark Souls. This is a game of skill. Recognizing the patterns, strengths, and weaknesses of your enemies is important. The single most important thing to learn about combat is not to panic. Panic leads to rash decisions, which lead to death. Patience and discipline are essential to living for more than a few minutes at a time. Depending on your preferences, you can opt to wield magic or fire, build a strength character to pummel enemies with big hammers, or use dexterity to become a slasher of supreme order. Most of the time, combat is fair. Sometimes, it is absolutely not. This game loves to toss swarms of multiple enemies at you, and sometimes it’s more than a bit unreasonable. But in the end, it’s still a Dark Souls game. The sense of achievement when you tackle a tough foe is real enough. So too is the despair when you encounter a baddie that you just can’t see a way around. The challenge itself is the draw. For the most part, that’s enough. But you may reach a moment, as I did, when you start to wonder why you’re doing this. I made it about halfway through before this persistent question began to erode my enjoyment of the combat. Forty-three hours after starting the game, I watched my character take a seat on a throne. The throne was inside of some hut, which itself was buried deep within a fortress. The doors of this hut closed slowly, drenching my warrior in inky blackness and the game ended. My character had fought long and hard to sit in the dark by himself. Surely his last thought about his experiences must have mirrored my own: Is this all there is?